Why is early evaluation important? When your child reaches the age of 7, the American Association of Orthodontists suggests that their first orthodontic visit should occur. Why? The reason is not to start treatment or to put on braces, but rather to follow the growth of the child and determine if, at some point, intervention may be necessary to PREVENT more aggressive problems from occurring later in the child’s growth and development. Don’t miss an opportunity to be preventative with your child’s dental health. Having annual or semi-annual appointments can help in prevention. At Zaytoun Orthodontics we take pride in making your child’s early screening as painless, pleasant, and efficient as possible. Schedule an early screening with one of our orthodontists in Raleigh, Cary or Garner. What kind of technology is best for orthodontics? While some dental technologies on the surface may look beneficial, not all add value to a patient’s treatment. However, one beneficial technological advancement in orthodontics has been the Digital Scanner which is used instead of alginate to take impressions of your teeth. It takes hundreds of fast-paced digital images to replicate your teeth and smile while increasing the quality and efficiency over alginate impressions. This has made the overall patient experience more pleasant. The scanning process also increases accuracy, especially in conjunction with Aligner treatment (Invisalign) and only takes five minutes to complete! At Zaytoun Orthodontics we make sure our offices in Garner, Cary, and Raleigh are up to date with the best equipment to keep our patients healthy and comfortable. Schedule an appointment to see the digital scan of your teeth! What are some best practices for Invisalign? As for Aligners (Invisalign), most people know what they do- They straighten teeth without braces. But what most people do not know is that there are two basic ways Aligners are prepared for the patient’s use. One is primarily by computer or lab technicians who have never examined the patient, and the other, is by an orthodontist who is experienced with straightening teeth with both braces AND If your treatment is done by an orthodontist who directly dictates your tooth movement treatment, your chance of a successful and timely treatment is increased dramatically. Don’t be shy. Ask about your doctor’s experience! At Zaytoun Orthodontics in Garner, Cary, and Raleigh all of our orthodontists have an incredible amount of experience with Invisalign. If you are looking for Invisalign in Raleigh, Cary, or Garner, let our specialist help you straighten your smile. If you get good preventative early treatment for your child, if your orthodontist uses technology that directly benefits your treatment and if your Aligners are designed by an expert in moving teeth then your dental health will be getting the best care and attention available. At Zaytoun Orthodontics we believe that these practices are necessary for a great orthodontic experience. 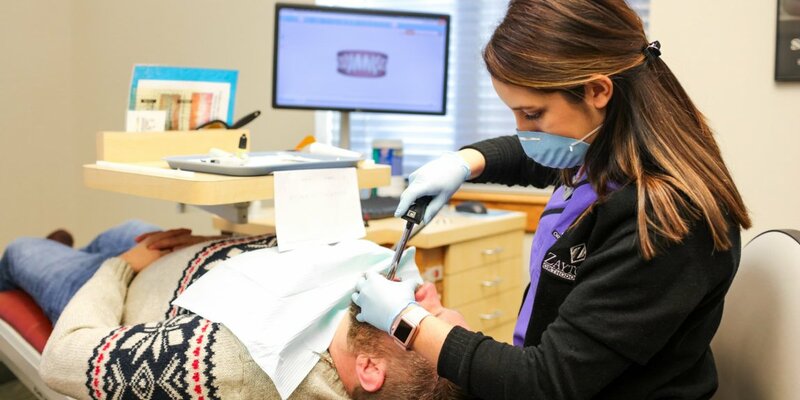 Let our staff care for your smile, whether you are looking for an orthodontist in Cary, an orthodontist in Garner, or an orthodontist in Raleigh, we’ve got you covered! Give our staff a call to schedule your complimentary appointment today!